We’d love your help. Let us know what’s wrong with this preview of Your Six-Year-Old by Louise Bates Ames. The six-year-old is a complex child, entirely different from the five-year-old. Though many of the changes are for the good -- Six is growing more mature, more independent, more daring and adventurous -- this is not necessarily an easy time for the little girl or boy. Relationships with mothers are troubled -- most of the time Six adores mother, but whenever things go wr The six-year-old is a complex child, entirely different from the five-year-old. Though many of the changes are for the good -- Six is growing more mature, more independent, more daring and adventurous -- this is not necessarily an easy time for the little girl or boy. Relationships with mothers are troubled -- most of the time Six adores mother, but whenever things go wrong, it's her fault. It used to be, at Five, that she was the center of the child's universe; now, the child is the center of his own universe. To ask other readers questions about Your Six-Year-Old, please sign up. I've never been one to consult so-called "parenting books" and this is not one of those, per se. As my daughter neared the age of 6, I found her behaviors to be increasingly vexing and our relationship started to deteriorate rapidly. I felt like I didn't know her anymore, as I did not understand the causes or motivations behind her most frustrating actions (or inactions). This book is slightly outdated (the section on discouraging boys and girls from playing together was particularly useless in m I've never been one to consult so-called "parenting books" and this is not one of those, per se. As my daughter neared the age of 6, I found her behaviors to be increasingly vexing and our relationship started to deteriorate rapidly. I felt like I didn't know her anymore, as I did not understand the causes or motivations behind her most frustrating actions (or inactions). This book is slightly outdated (the section on discouraging boys and girls from playing together was particularly useless in my opinion), but offers up marvelous insight into why six-year-olds can literally love you to pieces one minute and hate your guts the next. A lot of time is devoted to exploring the six-year-old's relationship with his or her mother, which is helpful to me, of course. Not much help for dads here, as they're pretty much written off as not being around enough to help out with the children. LOL! This book was written in 1979. But I haven't seen a more recent book that so specifically describes approximate age related behaviors and how they relate to discipline issues. Ames' writing is easy to read. It's gentle, kind, and compassionate, reminding me to be, too. Apparently six is a difficult age. I was surprised and relieved to find out that this is normal. - Give as few direct commands as possibl This book was written in 1979. But I haven't seen a more recent book that so specifically describes approximate age related behaviors and how they relate to discipline issues. - Isolation, removing child from scene, or separating two of you from each other. The two books I have read by Ames were very similar. I am not sure if that is because the two ages are similar (two and six), or if they are all the same, basically sidestepping confrontation and trying to get compliance in other ways. This advice is difficult for me to swallow with my six year old. I’m a little afraid he’ll turn into a holy terror without parental strictness. These Ames and Ilg books are by far the most useful parenting books I have read. Actually, they aren't about parenting, they are about child development. But learning that my children's annoying habits are merely a developmental phases AND that they will pass is incredibly helpful. Very outdated, but also very encouraging. Helped me to realize my struggles with my six year old are normal, and I got some ideas about making our day to day life go a little more smoothly considering her age and development. Interesting, but hilariously out-of-date. Written in 1979, it includes things like constitutional psychology (a defunct 1940s theory correlating body type with temperament) and quaint asides like "At mealtimes, when things are so very likely to go wrong ... the path of wisdom is to have your child sit beside Mother and as far from Father as the size of the table permits. I think I'm going to start a new category of fascinatingly out-of-date books. I'd quote the whole book here if I had enough time and space and it wasn't illegal to do so. This book quite accurately describes exactly what Hen is like right now. Unfortunately, age six is when kids pull away from their primary caregiver, who up to this point has been the center of their lives, and start placing themselves in the center. During this time of transition, the child often finds it difficult to make a decision - they do but they don't, they can but they can't - this sort of thing. I'd quote the whole book here if I had enough time and space and it wasn't illegal to do so. This book quite accurately describes exactly what Hen is like right now. Unfortunately, age six is when kids pull away from their primary caregiver, who up to this point has been the center of their lives, and start placing themselves in the center. During this time of transition, the child often finds it difficult to make a decision - they do but they don't, they can but they can't - this sort of thing. As if this wasn't already enough to drive you out of your parental mind, they are moody, aggressive, etc. Thank goodness, this type of behavior is generally reserved for their main caregivers. This at least means when they are out of your care, they are most likely well-behaved. Perhaps most appreciated is the list of techniques one can use to try and curb the disruptive, unpleasant behavior. 1. Praise - No matter how difficult it may be, try to find a particular aspect of the day and your child's behavior that you can praise. 2. Chances - If at first the child refuses or ignores a request, acknowledge that this is a difficult moment and that more than one chance might be needed in order to get things done. For instance, when a child tells you he won't do something, instead of becoming combative, try saying, "I guess you're going to need three chances on this one." 3. Counting - You give your child a simple request. They do nothing. You say, "And let's see if you can do that before I count to ten." I used this with great success. 4. Sidestep - Instead of meeting defiance head-on, change the subject or situation. Give as few commands as possible to avoid setting yourself up for a combative confrontation. If you need something done, make an indirect request. 5. Bargain - Don't overuse this one or you may appear weak. But break it out when needed. A good response for constant pestering is to offer a given reward for a completed daily task. 6. Give in - For those moments when you find yourself battling over something insignificant, you can say, "Well, I guess it doesn't really matter," and let him win one. I will absolutely be checking out her next age book as Hen's birthday approaches so I know what to expect. What a relief to read this and know we're not alone in dealing with a completely vexing six year old! The authors are right on the money --and most of it rings true even though the book was written a number of years ago. I highly recommend it for parents of 6 year olds and parents of 5 year olds (so you know what's coming). The book is logical, sincere, *not* preachy and very often funny. A quick read, too (which is great because parents of 6 year olds don't have much time or energy for reading What a relief to read this and know we're not alone in dealing with a completely vexing six year old! The authors are right on the money --and most of it rings true even though the book was written a number of years ago. I highly recommend it for parents of 6 year olds and parents of 5 year olds (so you know what's coming). The book is logical, sincere, *not* preachy and very often funny. A quick read, too (which is great because parents of 6 year olds don't have much time or energy for reading long, tedious tomes on child rearing.) Read it! You won't regret it. All of these books are simple and old-fashioned, but this is the first one where the balance between that and the positive info about kids was negative. The gender narrative was way harder hitting, maybe because the kids they are talking about are getting older. This one included the instruction that girls should be taught that it's boys who do the calling. I mean, c'mon. This might be the last one I read. The pressures and influences on children may change from decade to decade, but the study of the cognitive, physical and intellectual growth varies little. This is an easy-to-read and helpful guide, and the pictures of the six-year-olds, circa 1979, add to the wholesome and, at times, "retro" quality of the book. I had many of the same haircuts and clothes! I'm amazed at how accurate this book is--it described many of my six-year-old daughter's current behaviors to a tee. The authors are careful to include as many variations as they can, and to point out that every child is different--but still, it was interesting to see how my child fit the profile. Least favorite part of 6 year olds. I heart these books so much. My go-to parenting guide series for understanding what behaviors are "typical" as my children grow up. This volume helped me appreciate that while my six-year-old is a bit of a hot mess, that's typical and while he may be prone to breakdowns, he's also glad to be the life of the party, so I should look for situations where he can shine. I really wish the Gesell Institute would update these. They're wonderful, but you have to do so much reading through the lense of 35+ years of changing culture to My go-to parenting guide series for understanding what behaviors are "typical" as my children grow up. I really wish the Gesell Institute would update these. They're wonderful, but you have to do so much reading through the lense of 35+ years of changing culture to tease out the good parts. Still, most of this was good and it was really only the chapter on school readiness that screamed this was written in a completely different generation (1st-graders don't have to be reading yet, but they should be able to walk to a familiar location a few blocks away all by themselves). I love this series. I started with the 2 yo one and then skipped to the 6yo book, but both times it was measly helpful! The cultural parenting norms are out of date (great throw back to our parents and grandparents), but the child behaviors and general sense about how to react is soo helpful. Now when my 6yo yells at me or The Best Husband Ever, or defies his teacher, I can laugh - and apply an appropriate consequence without going nuclear. We have been at our wits end with our six year old. We often felt that perhaps she (or we) needed therapy. Surely this kind of behavior couldn't be normal, right? 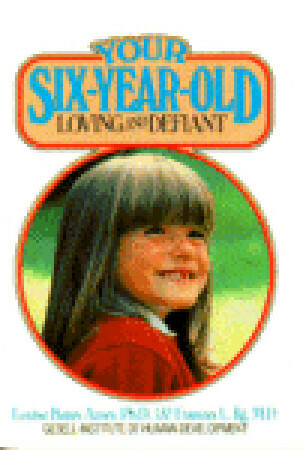 But after reading this book we're much reassured that our little one is actually pretty normal for six. And knowing that makes it easier to take. And this wonderful book provides some exceptional tips for loving with six year olds and not losing your mind. Our eldest will be six in a month so I decided to read this and oh, wow, does this describe EVERYTHING we have dealt with in the last five or six months. Which fortunately seems to mean smoother sailing is ahead. old-fashioned, but useful, just as all the rest of the books in the series have been. Great book, just ignore dates gender roles. This is a helpful - if a bit outdated - summary of what one can expect from a "typical" six-year-old. The author repeats numerous times that each child is an individual and therefore what is considered "normal" is actually an average of a certain number of children of the same age and cannot be held as a standard that each child must meet or somehow be found wanting. The biggest help to me, personally, was the description of how many six-year-olds experience mercurial mood swings that can be very This is a helpful - if a bit outdated - summary of what one can expect from a "typical" six-year-old. The author repeats numerous times that each child is an individual and therefore what is considered "normal" is actually an average of a certain number of children of the same age and cannot be held as a standard that each child must meet or somehow be found wanting. The biggest help to me, personally, was the description of how many six-year-olds experience mercurial mood swings that can be very hard for the parents to keep up with and cope. Likewise, the discussion of how this age is a very strong age of self-individuation from the mother and how difficult that can be for both child and mother was very helpful to me. I'm in the process of adopting two boys, one of which is about to turn six. Since I have never been a parent, issues like bath time, bed time, diet, education, etc., are completely new to me. I was looking for a book that would give me the inside scoop on what to expect developmentally with a six-year-old. This book, although written in 1979, met that standard. However, some of the techniques they suggest seem questionable and outdated. There were also many points that the authors repeated severa I'm in the process of adopting two boys, one of which is about to turn six. Since I have never been a parent, issues like bath time, bed time, diet, education, etc., are completely new to me. I was looking for a book that would give me the inside scoop on what to expect developmentally with a six-year-old. This book, although written in 1979, met that standard. However, some of the techniques they suggest seem questionable and outdated. There were also many points that the authors repeated several times though out the book. This repetitiveness was unnecessary and seemed as though it was simply filler to make the book longer, especially toward the end. I have read one other book in this series, and what i like about them is that they tell you something about what is typical behavior. I find that useful in judging how worried I should be about some sort of thing a kid is doing. This one was similarly useful, but, perhaps an old edition because some of the information was quite dated. I first noted this in some of the discussion about six year olds starting all day school for the first time (kindergarten is full day here, and many kids have been I have read one other book in this series, and what i like about them is that they tell you something about what is typical behavior. I find that useful in judging how worried I should be about some sort of thing a kid is doing. Louise Bates Ames was an American psychologist specializing in child development. Ames was known as a pioneer of child development studies, introducing the theory of child development stages to popular discourse. Ames authored numerous internationally renowned books on the stages of child development, hosted a television show on child development, and co-founded the Gesell Institute of Child D Louise Bates Ames was an American psychologist specializing in child development. Ames was known as a pioneer of child development studies, introducing the theory of child development stages to popular discourse. Ames authored numerous internationally renowned books on the stages of child development, hosted a television show on child development, and co-founded the Gesell Institute of Child Development in New Haven, CT.